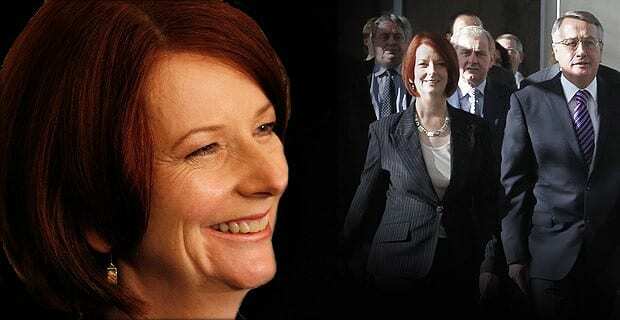 Gillard makes history as Australia’s first woman prime-minister. Today marks an important historical milestone for Australian politics and civil society. Julia Gillard is without a doubt Labor’s best political operative and most effective communicator. She has shown she can cut through. Ultimately, this is what sealed Kevin Rudd’s fate. Rudd was only able to communicate during campaign set-pieces – like the health debate with Abbott or during the election campaign. For the last two years he has mostly sounded like a technocrat – and Australia stopped listening. While I welcome Julia’s prime ministership, I am deeply concerned about the circumstances surrounding her ascendancy. The New South Wales Right faction demonstrated its dangerous level of clout. Sick of being ignored, they turned on the man they installed over Beasley. They have shown a remarkable tendancy to quickly do in the leaders that do not treat them with almost slavish attention – Nathan Rees, Morris Iemma and now Kevin Rudd. Rudd largely ignored the factions – now they have strongly reasserted themselves as central to the exercise of power in the Federal Parliamentary Labor Party. The fact that the parliamentary leadership of the Labor Party is determined by the vote of only Members of Parliament is now shown to be open to the manipulation of powerful, unaccountable factional forces. The destabilisation of Simon Crean in 2003-04 is also testament to this, as was the dumping of Bob Hawke. Rudd’s downfall is testament to the fact that leaders can too easily be destabilised. Australian Labor needs to broaden the pool of people involved in the election of the leader. The UK Labour Party has a vote of Parliamentarians, union affiliates and members. Not only do MPs vote, but (of course) their Members of European Parliament vote, as do local “constituency” Labor Parties and affiliated socialist societies. A third of the vote goes to MPs and MEPs, individual party members and affiliated organisations. This seems to me to be a far better system, ensuring a far greater mandate for the elected leader, as well as ensuring greater stability. Federal Labor has had some terrible leadership tensions in the past (thankfully avoided in this current very quick leadership change). Fundamentally Labor needs to modernise so as to become more resilient to the arbitrary exercise of power by a sole group within the Parliamentary Party. Gillard is the right choice for Labor leader. She will lead Labor to victory. It is just as well that the NSW Right has made the correct decision in this case. But they will not always do so, and Labor as an organisation must secure itself against the possibility of future bad decisions. As a member of the Labor Party, I am attracted to the idea of having more of a say in who leads the Party. But, I do believe that we need to be careful about consistency in terms of electorate mandate. Despite the media's misguided, yet predictable, talk of an unelected PM, her ascendancy can nevertheless be traced down through to the average punter on the street who elects their local member. It is at least formally consistent. If members of the Party, and unions, were to be given a formal say in matters such as this, the electorate's vote would be diluted – arguably distorted – by Party votes. And while I like aspects of this (particularly with the perceived irrelevance of Party membership), it risks alienating the broader public – both formally and psychologically. The informal dominance of factional war-lords is concerning, but we must, I believe, look to counter it with mechanisms that do not dilute formal representative consistency. Perhaps one of the best methods here is to focus on pre-selections, ensuring that rank and file, and union, etc. votes are genuinely effective. This is a key point at which factional kingmakers gain – and wield – their power. So, I like the sentiment of you suggestions, but I'd broaden the base and ensure democratic engagement at the preselection stage, rather than fiddling with moves to step over sitting members in leadership ballots. Look at the UK Labour Party – which has seen 1000s of new members join who are committed to voting out the Tories and have a say in how will lead Labor. I think opening up these kinds of decisions would see a larger party membership and greater participation as well as make union affiliation to Labor even more meaningful. UK Labour has certainly resolved these issues and I believe Australian Labor can also. I'm with you Alex. I was disappointed when Gillard didn't lead the Labor party in the 2007 election, and have remained a big supporter of her. What disturbs me is the unfettered power of the right factions in the Party, and that we currently have a Prime Minister that no-one in the general populace elected to that role. I hope and believe Julia will be a great PM. That's not the point though. The process by which she has secured the role should disturb anyone who believes in democracy. I'm not overly concerned about the "no one voted for her". We don't have a presidential system of government, we don't directly elect the Prime Minister (the position of which is not even mentioned in the Constitution). Even though the 2007 election was presidential in nature (with Kevin 07), it remains a fact that Gillard was elected as deputy prime minister with the sure knowledge that if Kevin Rudd carked it, it was likely that she'd lead the country (duly elected through our Westminster system). However, the role of the National Right in orchestrating the Rudd downfall was corrosive to democracy. In my view, Labor must change the way it elects its leader to be more like the UK Labour system.